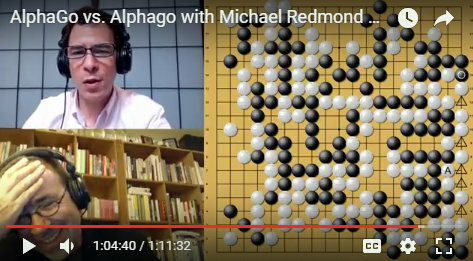 “In this game AlphaGo shows great flexibility in the early stages, and also its ability to calculate extremely complicated fights later in the game,” says Michael Redmond 9P in his commentary on Game 2 in the AlphaGo-AlphaGo self-played series. Click here for his video commentary, hosted by the AGA E-Journal’s Chris Garlock, and follow along with the sgf below, which includes the extra variations Redmond refers to in the video. “Against Black’s sanrensei, White plays two unusual moves at 10 and 16 to create a unique opening,” says Redmond. “As the fighting starts, White makes a surprising sacrifice, abandoning a group to take the offensive in the center. Fighting continues throughout the game to climax in a final huge ko.” The video is produced by Michael Wanek and Andrew Jackson.